N.B. This post assumes some knowledge of an Android app called Locus Free. To read more about how we used Locus Free for navigation and geospatial sampling read this post first. Imagine that your organization is working in a new area for the first time. If you are working in the United States, you can most likely open up any number of online map services to learn about road density, quality of roads, other important businesses and landmarks in the area, etc. If you are working in rural Tanzania, this is much less likely. Without detailed transportation maps, your organization might lose time and money, getting lost, encountering impasses, getting stuck, etc. To make it worse, the lessons learned by one person in one vehicle are not easily transferred to others. Luckily there are cheap and easy solutions to manage this challenge. For our work, we have been using the same Android devices used to collect data and the Locus Free application we were already using to navigate to particular points in the field. Using our Android devices and the Locus Free app we recorded the route our vehicle took each day. During our first pilot, we were only using one vehicle/driver, so sharing tracks between devices was not necessary. For projects using more than one vehicle, it might help to share track files between devices. We also simply recorded our track. If a track/road ends abruptly, we assumed that the road was impassable and avoided it. In the future we might label obstacles (no road continuing, tree across road, too muddy to continue, etc.). Doing so would provide helpful context. As an example, a road that is too muddy to drive on in the rainy season might be great to use in the dry season. Used well, OSM can be incredibly useful and add even more value to the track files that you record. Comparison Map. 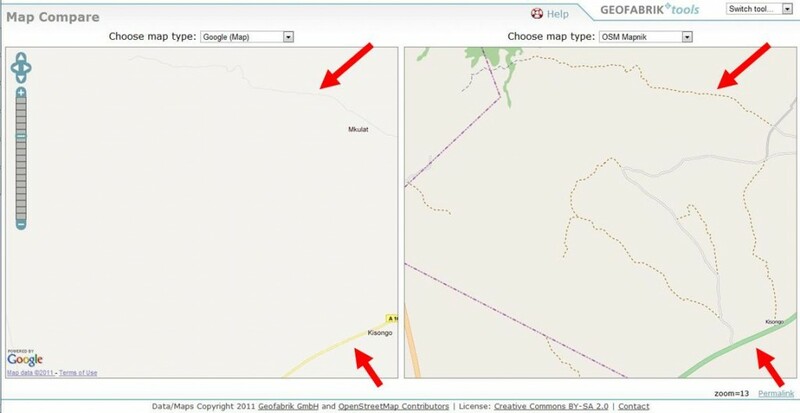 Before AfSIS starting working in the Kisongo, Musa, and Mateves wards, just west of Arusha, Tanzania, these two maps looked very similar. AfSIS was able to contribute the dotted brown lines that represent previously unrecorded dirt roads. Admittedly, your organization does not have to contribute its tracks to Open Street Maps to take advantage of the tracks it records, but doing so can be helpful for you, other organizations, and, most importantly, the community you are serving. Your organization can save and use your road data without uploading it to Open Street Map, but that assumes the data will be managed well and passed on from year to year and from person to person. The easiest way to make sure the information is still available in the future is to upload it to OSM. Other organizations face the same challenges that your organization does, and there is no reason why we should all re-track the same roads, get stuck in the same mud pits, and get lost at the same intersections. Your organization’s minor efforts can save another from tremendous headaches. An unmapped community is almost always an underrepresented community. Road maps (even of dirt roads) represent an opportunity for increased access to public and private goods/services. Road maps often influence government policies and private business strategies in the same way that the census data and government registration can. People always count, but they can more easily access resources when they are counted. Road mapping is an important part of that process.